The Pyramid of Cestius is a little-known gem in the city of Rome and the only construction of this kind in all Europe. It was erected around the year 12 B.C. as a sepulcher for a rich and religious magistrate. Originally, the pyramid was located on the outskirts of the city and surrounded by columns and two statues of bronze. It was built with bricks and cement and covered in white marble. Regarding the testimonials of the era, the interior was decorated with frescoes and statues of nymphs and on the corners of the top there were four winged Victories with crowns and ribbons. The Pyramid of Cestius is unusual due to its structure, much sharper than the Egyptian pyramids in which it was inspired. This can be because of the incorrect information gathered about the Egyptian style or because of an attempt of innovation. In the flanks of the pyramid we can read a dedicatory inscription together with another one that states that the work was completed in 330 days, number that is supposed to be wrong. It existed a bigger pyramid in Rome as well, known as the Pyramid of Romulus, which did not survive the deterioration of the passage of time. 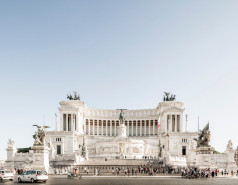 Its marble was finally reused for the construction of the Saint Peter’s Basilica. 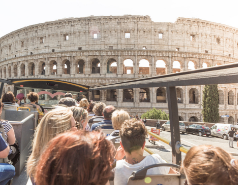 For those of you who want know more about this wonder of the Roman world, there are guided visits leaded by an expert on the matter, with previous reservation. If you are doing tourism in Rome and want to visit something different and unusual, do not hesitate to go to the Pyramid of Cestius. 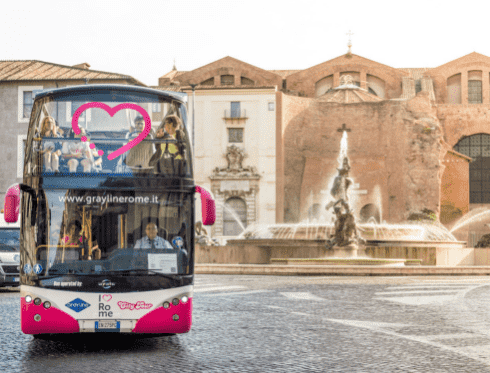 Roma City Tour offers you the possibility of getting there easily thanks to our tourist bus hop-on hop-off. Get off at the stop 4 after enjoying the panoramic views and audio guided visit and you will arrive to the pyramid after a stroll of 15 minutes. Let the Egyptian Rome surprise you!